This chapter is the first of four on the relationship of technology to social and political issues. 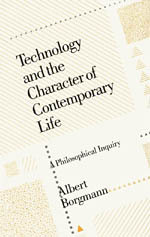 Borgmann is trying to argue that we should conceive of and judge society and politics in the light of technology, and that it is in social life or politics that the device paradigm must finally be discussed, since these areas of life are those that receive the most attention. Unfortunately, the fundamental modus operandi of technology is not yet recognized in this sphere. What is recognized is what we might call the problem of orientation, in other words the widespread feelings of disorientation, ungroundedness, and directionlessness prevalent in modern society. Technology has rendered all points in space and time equal (determined by consumptive intent and consumptive potentiality). This itself flows from the abstract, objective viewpoint of modern science—science might be able to describe all the places and events with which we interface, but it cannot tell us which is “home”; it cannot locate meaning for us in a privileged place or time. Of course, this is not a critique of science in general. Rather, it is technology as a social strategy which redraws human experience in this world with no guideposts. The way people address this widely-recognized if poorly-understood malaise is often to, in Borgmann’s terms, “raise the value question”. In other words, it is thought that what is needed to reorient our society is a clarification and perhaps reprioritization of “values”. According to Borgmann, however, (and laying aside the issue of the multiplicity of values), this strategy is futile in unmasking the device paradigm and showing it for what it is. The problem is that, very often, our discussion of values presupposes the means/ends distinction which is operative as a result of the technological paradigm; from this assumption, technology itself will never be able to be brought into clear relief (as we saw in earlier chapters). In modern education, the ends are what are seen as stable, and the means as radically interchangeable. Thus we have undergone a shift from education as passing down customs or “ways of doing things” to teaching goal-formulation and practical reason, with the result that tools and practices become mere means rather than vessels of orientation, used in a web of pre-existing meaning. Ultimately, in this environment, the values we most want to bring to the fore will forever be impossible to formulate. When commoditization potential becomes the measure of whether the means are leading to the ends, the non-quantifiable “values” will start to dematerialize. As Borgmann puts it, we can measure the number of Big Macs sold, or the number of times a family eats out. But how are we to measure the value of a family meal, prepared with care and celebrated with conversation? So-called “focal things”, which we encountered earlier as those things which are a source of full-facultied human engagement, cannot be argued for in the “values” conversation, when it continues to presuppose the paradigm of technology. In this chapter, Borgmann also considers a Marxist critique of modern society, to see whether it fares any better in bringing to light the working of the device paradigm. Ultimately, he disregards the critique as too shallow. On the Marxist story, there is always a definite class with undue power, influence, and wealth. What is really necessary is to divest this class of their privilege and distribute their benefits more equally. (There are of course totally capitalist versions of this thesis, and Borgmann goes into some interesting detail on how this a big part of the social theory underlying much of the latent political understanding in the US.) The problem here is not just that it is questionable whether there is really a definite class who can be thus Robin-Hooded. It is that technology and the device paradigm can be used quite happily towards this goal of “equality”, all the while continuing the trend of commoditization and disengagement. As long as technology operates in a free and equal manner, the Marxist has no more to say about it; and of course, this disburdenment and equality is part and parcel of the very promise of technology. So, it appears we need more tools or insight to bring an actual discussion of technology into the political and social arena. We begin this task in the next chapter by looking at the concept of “liberal democracy” (the kind of social theory Borgmann claims is actually operative in the US political system). Stimulating post Jonathan. It’s heartening to see Borgmann bring his questions on technology into the political realm. I mention this because it seems an unfortunate missed connection for Borgmann to try to distance himself from Marx’s critiques. Marx’s insights into the way commodities are fetishized – mystified and treated as something other than they are – would find happy company in Borgmann’s insights into the device paradigm. Moreover, now as ever, technology is an obvious and pervasive tool of class oppression, whereby masses are manipulated and their lifeblood extracted to keep an unjust system in place. We see it in advertising, big data, architecture, high-tech health care, high-frequency trading, energy and resource supplies, drone wars, the technology of culture and political systems themselves. In all these cases the classes or quasi-classes who own the lion’s share of the technology inflict terrors and stultify the natural human growth of the classes that don’t. A class analysis of oppressors versus oppressed is easily oversimplified, yes – not only are bourgeois oppressors oppressed by capitalists, not only do proletariats and the lumpenproletariat gain their scraps of “benefits” from the system, but even the worst oppressors can and do sacrifice their own lifeblood to the system. Nevertheless these recognitions do not detract from the structural and systemic question of qui bono, and who loses (everyone) by class realities. To set aside the question of class oppression in technology – to ask instead how we would relate to technology beyond class realities – is important in a spiritual sense but also too fast, too quickly removed from the ethical reality where we must live our lives. Who even gets to ask and answer the question? Certainly men in boardrooms and legislative halls much more so than any member of the proletariat or recent college graduate. How honest or applicable is the answer while present realities persist? To what extreme extents do all manner of anti-human oppressions and limitations lurk behind the interface of technological life so that a certain economic system may stay in place? Not sure what you make of that exactly, but it does imply to me that Borgmann values Marx’s insights, and has a pretty specific bone to pick here. This was a short but precise chapter for me. The value came from the relationships between technology, orientation and value. I didn’t get much from the direct connection to society or politics in this chapter — at least not yet. As we take up reality, disorientation follows. This is an interesting idea. Further, we try and ground our disorientation in the identification of ‘value.’ A story I’m reading in this chapter is that we use technology (means) to realize values (ends) and this simple connection is to provide orientation in the vast landscape of life. We gravitate to the things that are easy to define and measure and ascribe value. However, this is considerably more difficult in the focal practice world. I can’t help but think about the OSS metrics work that I’m starting up (CHAOSS). We have the ability to define metrics the come from the trace data that is evident in repositories (issues, PRs, and stars). The metrics alone (the commodities?) are not terribly interesting to people. They want to ascribe value to these metrics. I wonder if (according to Borgmann) we can do that. Can we have a collection of commodities (device paradigm) that are used to define value in the world (focal practices)? He does tell us that: in spite of (value) shortcomings, we should encourage discussions that raise value questions. “Without this familiar if inadequate approach, a fundamental analysis of technology remains forbidding. Moreover, values will remain an indispensable as ways of summarizing, recollecting, and preparing for our experiences with things. It is the fundamental status of values that must be rejected” (pg. 81).